my blog Why is Adding Meta Data Important? Why is Adding Meta Data Important? Adding meta data that “actually” correlates to your music is a crucial aspect of getting TV placements. Picture this, our publishers and supervisors pick up your music but what if your music is not needed today but needed tomorrow. How are our publishers and music supervisors supposed to find your music? Are they going to be searching back through emails, through each submission and folder? No. Music supervisors are always on the look out to find the right song/cue for the scene and usually need to do it as quick as possible. While they love to receive and pick fresh music daily and they often pull from their back-catalogs if they can’t find exactly what the need at the time. Then, how do they search for our tracks you may ask? They are using intuitive search engines and your keywords! This is why adding GREAT keywords is part of our protocol. 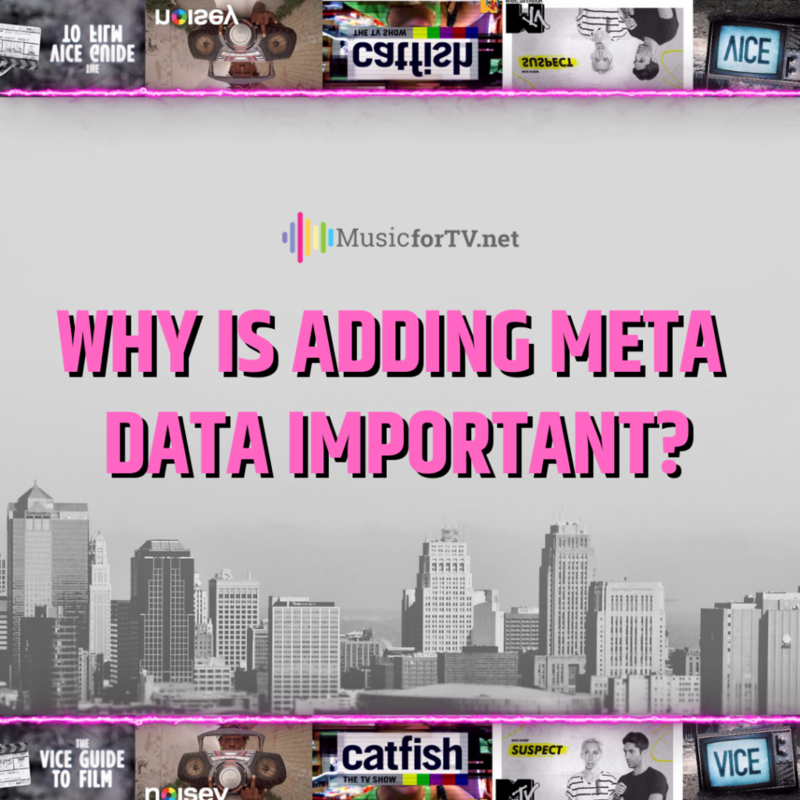 By adding meta data that actually describes your material will help you 10X your placements, income and keep your music relevant in our system for years to come. We compiled a list below of ways to improve your meta data, check them out! List the specific genre – if it’s a hip hop track, what kind of hip hop is it? Old school, Boom Bap, trap, 90’s hip hop? List the level of energy – is it low, medium, high, building energy? Describe the tempo – is it a slow, mid tempo, up tempo, very fast track? Describe what kind of scenes your track could be used in – comedy, love, lifestyle, night club, city night, documentary, exploration, technology, science, suspense etc. This is tried and true way to add an edge to your music placement business. Here’s some more helpful tips and tricks! Getting tv placements can be broken down to 4 easy to do steps. Follow them and you will have a framework to success. 1. Build Your Catalog – One track at a time. Create a vibrant and full catalog of music. What you are doing is creating intellectual property that you own. You want to create as much IP as you can! It’ll give you the freedom to buy, sell, license, trade whatever you want with your IP. Remember Quality over quantity and always think about your customer! That brings us to our next step. 2. Create Valuable Content – Don’t waste your time creating music people do not want to use or hear. Keep it modern and ask yourself questions like, Does this music sound modern, Is this a style that someone would want to use commercially, how can I be of maximum service and cater to the needs of today’s music industry? What type of music is actually getting placed and what style do they actually want? Another thing: Watch the TV shows and listen!! Do some research. You’ll hear what is being used and wanted in terms of style and type of music. Another thing that can devalue and break your songs chance of placement is how you structure or lay out your track. Create/Build your tracks with your customer in mind. Put yourself in the shoes of a music supervisor adding music into a show or film. They need transitions to move from one scene to the next, intros, outros, quick jump ins, vibes, moods, moment makers etc. Taking a day to strategize or do some research is super important! Secondly, recognizable and modern sounding tracks… you can’t go wrong with those! Listen to the Billboard top 100 tracks – those styles are in right now and always a good clue to what will work and is in popular demand. Lastly, create alt mixes of each cue you create! 3. Metadata – Spending countless hours on a track, perfecting it obsessively than not taking the time to add keywords to it is one of the worst mistakes you can do. Without keywords supervisors can’t find your tracks. Increase your odds and master metadata! Our publishers are always looking to pick up fresh tracks that just dropped into their inbox but they often pull from their back catalog – so using good keywords on your tracks is SUPER important and will help them find your tracks. Get creative with your metadata too! Honestly evaluate your music and add respective genre, mood, feels, vibes, scenes – imagine what someone would search while looking for your exact track. 4. Distribution– You need to get your music heard! We are one of many companies you can work with. Get your music in with MUSICFORTV and a few other companies, if you can find some! Maximize your sync/placement potential! Don’t put all your eggs in one basket! Feed all of your baskets at once with content! Create content, distribute content. Simple. If you asked me, I’d say never skip these steps! Hope these tips help! Stay consistent, and focused y’all!